Please meet my new friend, Môra the peacock. -Now you can take yourself a cup of coffee, or tea, or chocolate and some snack before you continue reading this post. This gonna be a very very long post. I promise. I was dreaming about a 3D peacock design, with brilliant colors, as close as possible with the real peacock. Something big start with little step. One day after I learned how to set stone, I drew another peacock sketch, this time with a stone as its body. I added note try to search for perfect blue-ish stone beside the sketch. My Feng Huang project gave me some insight how to make 3D head. I drew another peacock sketch: stone as its body and 3D head. I’ve done with body and head, but I still didn’t know how to make the tail. Meanwhile -for me- the tail -the feathers- is the most important part of a peacock. It was the most beautiful part of a peacock, and I have an ambition to make it as real as possible. My ambition got bigger when I purchased a real peacock feather. Its beauty really thrilled me. And I promised myself to do whatever I could to realize my peacock design. It took me over a year to solve this problem. I found this spike seahorse over the internet, and that AHHA!!!!! *a BIG lightbulb turned on in my head* came to me. I quickly grabbed my sketch book and sketched down another peacock drawing. This time I finally could sketched every details of it. I could even sketch down some insets with detailed size, materials, and colors of every parts!! What? You wanna know what did I write as note on my last sketch? 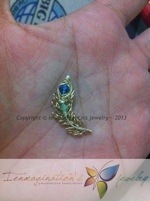 find perfect stone: blue with greenish one, with some sparkle if it’s possible. Next step was hunting for perfect materials. I planned to use dyed druzy at first, but I can’t find perfect druzy. As usual, the one with perfect color was either too big or too small..
Until one day a good friend of mine offered me this beautiful gems. A natural london blue topaz. Another AHHA!!!!! strike my mind. The color, the size, the sparkles.. All are PERFECT! Dang! I just had to take it. And generously, my friend gave me a great deal. Long story short, I got my perfect stone. Yeay!! After holding the gems in my hand, I know I can’t use my ordinary copper wire to wrap it. It’ll be a silly thing to do. So I save my money to buy some fine silver wire and gold-filled wire. I also started to collect all my sterling silver wire. Choosing the right SWAROVSKI colors was another issue. I finally took denim blue and peridot, both with AB coating. It took me almost 6 months to collect all materials needed. I used several techniques to make Môra: spike technique, making balled end wire, prong setting, and a bit hammering. I tried to use all these techniques in several projects. I really wanna ensure myself that I won’t make any single silly mistake (which I did!!!!). I won’t let myself touch the materials before I’m ready. I started to work on the body by setting the stone with prong setting. I made two different claws: a pair of standard prong claws, and a pair of balled end claws. Next step was forming its head. I weaved thin wire over the frame wire and form a 3D head with it. I also heated the end of each wire to make eyes. Flattened it a bit with my pliers while it was still hot to give it accent. 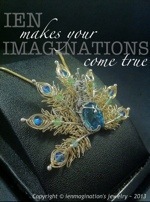 When my gold-filled wire arrived, I know I was ready to make the most important part of my project: the feathers. I added some very thin wire (about 0.2 mm wide) between each spikes of the feather then trimmed and flattened it using my pliers. These wires gave fluttering look to the feathers. Finally I assembled each parts, added a bail and a pin, so it could be worn as pendant and brooch. Môra is one of my milestones. It’s my first piece using real natural gemstones and gold-filled wire. It also a piece that I designed, planned and make with every effort that I can do. Like my friend said, I did go the whole nine yards to get to my dream-peacock. It took almost 4 years to bring my dream-peacock into real. Can I proudly tell you that Môra is my masterpiece? -it IS a long post, right? Hope you enjoy reading it just like I enjoy writing (err, typing) it. Thanks for reading, and see ya!! !